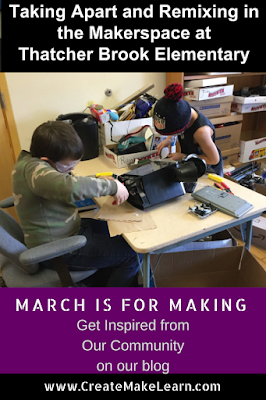 During today’s March is for Making blog post we get to check out Makers in Action at Thatcher Brook Elementary School - in Waterbury, Vermont. Thatcher Brook provides many opportunities for students to interact with STEAM (Science Technology Engineering Art and Mathematics) including a fantastic art program, Project Lead the Way, and now makerspace in the computer lab with a mobile maker cart that contains coding and circuit bins. The kids who come to the computer lab section of the makerspace have had a great time with hacking different electronics and toys and creating new things with them. The Thatcher Brook School Makerspace concept design started at the Create Make Learn Summer Institute. 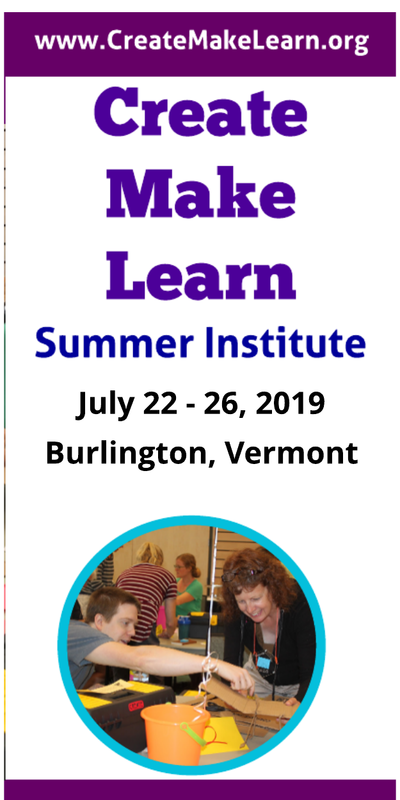 Teachers attending the Institute participate in hands on workshops that help them build their own maker skills, explore possibilities for making, and create a custom kit for a center for creating and making back in their school. After attending Create Make Learn Institute in 2015, art teacher MK Monley came back with a team of educators to experience makings first hands in hopes of adding a makerspace to the rich options that the school was providing for students to engage with h STEAM (Science Technology Engineering Art and Mathematics). Not only were students creating with technology in MK’s art program, they also had opportunities to to code and learn about engineering in Project Lead the Way. 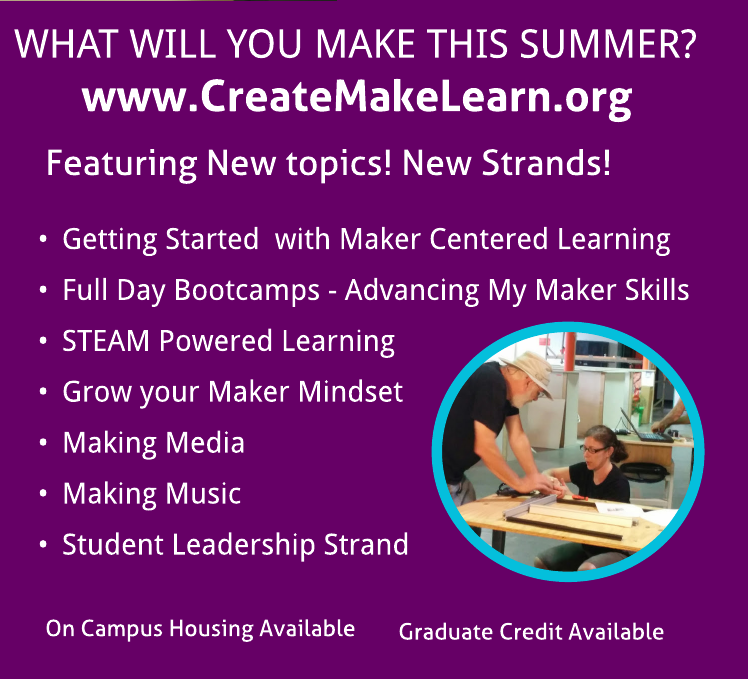 During the Create Make Learn Summer Institute, educators MK Monley, Lynn Pollock, Brenda Ververis, and Heather Morehouse started to plan and envision additional opportunities for students to become makers. Their plan was to transform one section of the school’s computer lab into an area for making and to add a mobile cart that contained tools and resources for making. They carefully considered how various resources would best meet their needs as they selected which tools to include in the custom maker kit from Create Make Learn. After some initial planning at the institute, they knew they wanted to engage their staff and students in the design of the space and purpose. By early October, the Makerspace had its own space as part of the computer lab and a mobile cart was equipped with coding robots and circuits bins. Students and educators drop into use the makerspace before and after school, during recess, and during choice time. The mobile maker bins are signed out by teachers to use in their classroom. The Coding bin with robots is one of the favorites. It allows students to extend the coding unit they have completed from Project Lead the Way. Teachers have also started to create centers for making in their own classrooms. Their next goal is to add more tools that would allow students to drill holes, hammer nails, and further extend their maker projects.